The master of public outrage and one-liner songs returns with a sizzling album of crunchy and top-notch guitar work. 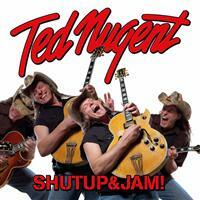 Most people have an opinion of loud-mouth veteran TED NUGENT. But still this is his 14th studio album. He sure is not afraid of hireling quality musicians as he is backed by old cohort Derek St Holmes on guitars and backing vocals, Greg Smith (ex. RAINBOW) on bass and DOKKEN wild man Mick Brown on drums. Ted sure do handles guitars and vocals himself. The title track opens with a shout and then it´s all frantic bluesy Rock´n´Roll. The lyrics will tell what´s the only hope of the US of America! The album consists of high octane guitar driven rock with a bluesy streak. The pace doesn´t change much which is the most annoying part. He lets Derek sing on the most bluesy track “Everything Matters” while SAMMY HAGAR is let loose singing on “She´s Gone”, a song a with a jam atmosphere. The usual guns and ammo subjects are found in “Do-Rags and a .45” and “Semper Fi”, but the humour department is the most present on the album. I for one enjoy the likes of the aforementioned “She´s Gone ”the titke track and, especially, “Love My BBQ”. But there is another side to Ted as he shows in “Never Stop Believing”. He also seems deeply concerned about the state of affairs in America. But most of all he shows no sign of slowing down an his guitar is tight and steaming. This little album is in fact a gem of 2014, and I strongly recommend you check it out.